In many of the world's military establishments, a brevet ( /brəˈvɛt/ ( listen ) or /ˈbrɛvɪt/ ( listen ))  was a warrant giving a commissioned officer a higher rank title as a reward for gallantry or meritorious conduct but without conferring the authority, precedence, or pay of real rank. An officer so promoted was referred to as being brevetted (for example, "he was brevetted major general "). The promotion would be noted in the officer's title (for example, "Bvt. Maj. Gen. Joshua L. Chamberlain " or "Bvt. Col. Arthur MacArthur "). Joshua Lawrence Chamberlain was an American college professor from the State of Maine, who volunteered during the American Civil War to join the Union Army. He became a highly respected and decorated Union officer, reaching the rank of brigadier general. He is best known for his gallantry at the Battle of Gettysburg, for which he was awarded the Medal of Honor. A Brevet d'état-major, commonly abbreviated to BEM, is a military distinction in France and Belgium which denotes that an officer has passed the École de guerre, the French Staff College. Though it is usually only seen in French, it can be abbreviated to SBH in Dutch. Between 1870 and 1940, an officier breveté was a graduate of the École supérieure de guerre. Nowadays, while many officers still attend the école de guerre, they do not use the term officier breveté. The more important brevet in the French military is the one of the École de guerre, the French Staff College. Between 1870 and 1940, an officier breveté was a graduate of the École supérieure de guerre. Nowadays, while many officers still attend the école de guerre, they do not use the term officier breveté. The École Militaire is a vast complex of buildings housing various military training facilities in the 7th arrondissement of Paris, France, southeast of the Champ de Mars. The French military does not use brevets to give officers a higher standing. It uses instead temporary commissions. As an example, Charles de Gaulle was promoted "provisional brigadier general" (général de brigade à titre provisoire) in 1940 when he was commander of an armoured division. In the United Kingdom the brevet commission was only by courtesy. Officially, both titles were used, as: "Major and Brevet Lieutenant Colonel Cornwallis". Originally the term designated a promotion given on such occasions as a coronation, or the termination of a great war, and had its origin during the reign of King James II (1685–1688); but it was abused so frequently and used to such an extent by the general award of brevet commissions that from 1854, during the Crimean War of 1853-1856 and subsequently, its bestowal was limited[ by whom? ] strictly to cases of very distinguished service in the field and on the principle of seniority. The British Army confined brevet commissions to ranks from captain to lieutenant-colonel. In the 19th-century U.S. Army, brevet promotions were quite common because the army had many frontier forts to garrison and other missions to perform but could not always appoint appropriately ranked officers to command these forts or missions. The U.S. Congress permitted only a limited number of officers of each rank. Thus, an officer of lower rank might receive a brevet commission to a rank more appropriate for his assignment. Also, newly commissioned officers often received brevet rank until authorized positions became available. For example, an officer might graduate from West Point and be appointed a brevet second lieutenant until a permanent second lieutenant posting opened up. In early 1861, some recent graduates of West Point temporarily were named brevet second lieutenants because not enough Regular Army officer vacancies were available to give them commissions as regular second lieutenants. In addition to officers being appointed to a brevet rank to temporarily serve in positions designated for higher-ranked officers (i.e., in lieu of promotion to permanent rank), officers might be awarded brevet rank as recognition for gallantry or meritorious service. The practice of brevetting disappeared from the (regular) U.S. military at the end of the 19th century; honors were bestowed instead with a series of medals. Brevetting was declared obsolete in 1922. However, the similar practice of frocking continues in four of the five branches of the U.S. armed forces. The U.S. Air Force does not allow the regular practice of frocking before a promotion date, except in rare circumstances, such as when an officer selected for promotion is assigned to a billet (typically a senior joint duty assignment), that requires him or her to hold/wear the higher rank to which he/she is expected to be promoted. Frocking typically requires special approval to be obtained from the service headquarters. ↑ "the definition of brevet". www.dictionary.com. ↑ Boatner III, Mark M. (1991). The Civil War Dictionary. New York: Vintage Books. p. 84. ISBN 0-679-73392-2. ↑ "Service historique de la Défense". Servicehistorique.sga.defense.gouv.fr. Archived from the original on 2009-05-06. Retrieved 2009-07-01. ↑ Code de la Défense, art. L4134-2. ↑ Holmes, Richard (2001) . "Chapter III - Brothers of the Blade". Redcoat: the British soldier in the age of horse and musket (Hardback ed.). London: HarperCollins. pp. 166–179. ISBN 0-00-257097-1. 1 2 Hunt, "Introduction", p. v.
↑ Faust, Patricia L., ed. Historical Times Illustrated Encyclopedia of the Civil War, p. 79. Harper & Row, Publishers, Inc., New York, NY, 1986. ISBN 0-06-181261-7. ↑ Boatner, III, Mark M., The Civil War Dictionary, p. 84, David McKay Company, Inc., New York, 1959. ISBN 0-679-50013-8. ↑ Warner, Ezra J. Generals in Blue, p. xvii. Louisiana State University Press, 1964. ISBN 978-0-8071-0822-2. 1 2 3 4 Boatner, III, p. 84. ↑ Warner, Generals in Blue, p. xxiv. ↑ Weinert, pp. 5-6; Faust, p. 79. ↑ "Marine Corps Brevet Medal". Foxfall Medals. Retrieved 2007-10-10. ↑ "Brevet - military rank". britannica.com. United States military seniority is the method by which the United States Armed Forces determines precedence among commissioned officers, in particular those who hold the same rank. Seniority is used to determine assignments, tactical commands, promotions and general courtesy. To a lesser extent, historical seniority is used to recognize status of honor given to early United States military leaders such as inaugural holders of certain ranks or those officers who served as leadership during major wars and armed conflicts. John Cleveland Robinson had a long and distinguished career in the United States Army, fighting in numerous wars and culminating his career as a Union Army brigadier general of volunteers and brevet major general of volunteers in the American Civil War. In 1866, President Andrew Johnson nominated and the U.S. Senate confirmed Robinson's appointment to the brevet grade of major general in the regular army. He was a recipient of the Medal of Honor for valor in action in 1864 near Spotsylvania Courthouse, Virginia, where he lost a leg. When he retired from the U.S. Army on May 6, 1869, he was placed on the retired list as a full rank major general, USA. After his army service, he was Lieutenant Governor of New York from 1873 to 1874 and served two terms as the president of the Grand Army of the Republic. The Regular Army of the United States succeeded the Continental Army as the country's permanent, professional land-based military force. Even in modern times the professional core of the United States Army continues to be called the Regular Army. From the time of the American Revolution until after the Spanish–American War, state militias and volunteer regiments organized by the states supported the smaller Regular Army of the United States. These volunteer regiments came to be called United States Volunteers (USV) in contrast to the Regular United States Army (USA). During the American Civil War, about 97 percent of the Union Army was United States Volunteers. James William Forsyth was a U.S. Army officer and general. 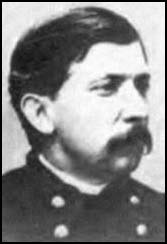 He was primarily a Union staff officer during the American Civil War and cavalry regimental commander during the Indian Wars. Forsyth is best known for having commanded the 7th Cavalry at the Wounded Knee Massacre on December 29, 1890 during which more than 150 men, women, and children of the Lakota were killed and 51 were wounded. Thomas Casimer Devin was a United States Army officer and general. He commanded Union cavalry during the American Civil War and during the Indian Wars. John Irvin Gregg was a career U.S. Army officer. He fought in the Mexican–American War and during the American Civil War as a colonel and near the end of the war as a brevet general in the Union army. In 1866, he was nominated and confirmed as a brevet major general of volunteers and a brevet brigadier general in the Regular Army, both to rank from March 13, 1865. Robert Seaman Granger was a career officer in the United States Army, reaching the brevet rank of major general in the Union Army during the American Civil War. Alexander Cummings McWhorter Pennington Jr., was an artillery officer and brigadier general in the United States Army and a veteran of both the American Civil War and Spanish–American War. James Madison Robertson was an artillery officer in the United States Army who commanded the U.S. Horse Artillery Brigade during the American Civil War. Horatio Gates Gibson was a career artillery officer in the United States Army, and colonel in the American Civil War. In 1866, he was nominated and confirmed for appointment as a brevet brigadier general of volunteers to rank from March 13, 1865. The general officers of the Confederate States Army (CSA) were the senior military leaders of the Confederacy during the American Civil War of 1861–1865. They were often former officers from the United States Army prior to the Civil War, while others were given the rank based on merit or when necessity demanded. Most Confederate generals needed confirmation from the Confederate Congress, much like prospective generals in the modern U.S. armed forces. Charles Henry Tompkins was a Union Army colonel, who received an appointment to the brevet grade of Brigadier General of volunteers during the American Civil War. He was a recipient of the Medal of Honor for valor in action on June 1, 1861 in the Battle of Fairfax Court House. This was the first action in the Civil War for which a Union Army officer would receive the Medal of Honor, although it was not awarded until 1893. He is not to be confused with another Union officer, Brevet Brigadier General Charles H. Tompkins who commanded the 1st Rhode Island Light Artillery Regiment. William Henry Penrose was a United States Army officer who served in the Union Army during the American Civil War. 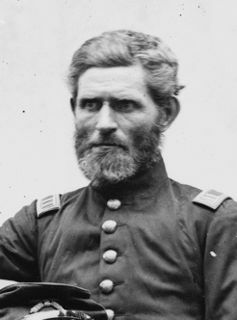 Penrose commanded the First New Jersey Brigade and ended the war with the rank of brigadier general. Wikisource has the text of the 1911 Encyclopædia Britannica article Brevet .